Making space. : "Shiny, shiny, shiny... so nice." It’s Tuesday morning… and already I feel like it’s been one of those weeks. You know those weeks? It’s one of those weeks where it feels like the windows to my soul are forecasted to be stormy and rainy. The holidays are on horizon in every time zone, and the enemy’s trying to entangle the tinsel. He's making pathetic attempts to stomp out the thanksgiving and joy we were designed for. So this morning I need to tell a story that’s not about tangles, but is about Truth. A story about car washes and other things that shine brighter than tinsel. I need to “Amen” to the Truth that is constant and the Truth that is promised to you and to me. I need to speak out His promises already being fulfilled to stomp out the encroaching lies. I met Samkelo and Bongani almost as soon as I got to Africa. I stayed in the family home of these 12-year old identical twins for 5 days when I first came to “visit”. I was immediately amazed then by the servant-hearts of these boys who were the men of a family of 10, and who were always at church first to help clean and set-up. Almost 3 years later, these 15-year olds are squeaking and stumbling their ways into being fine young men of God. Along the way, family members have come and gone, a house was burned and a house was built, and one time Samkelo proposed to me. Fourteen months into my life in Africa, the glorious day came when I was able to purchase a car and drive myself to church. Samkelo and Bongani’s aunties started passing me notes like schoolgirls, asking if that was “our new car parked under the tree”. It was indeed, and as part of the family, the car was considered the family’s. Instead of demanding transportation and field trips, however, this family and these boys taught me a lesson on Family. 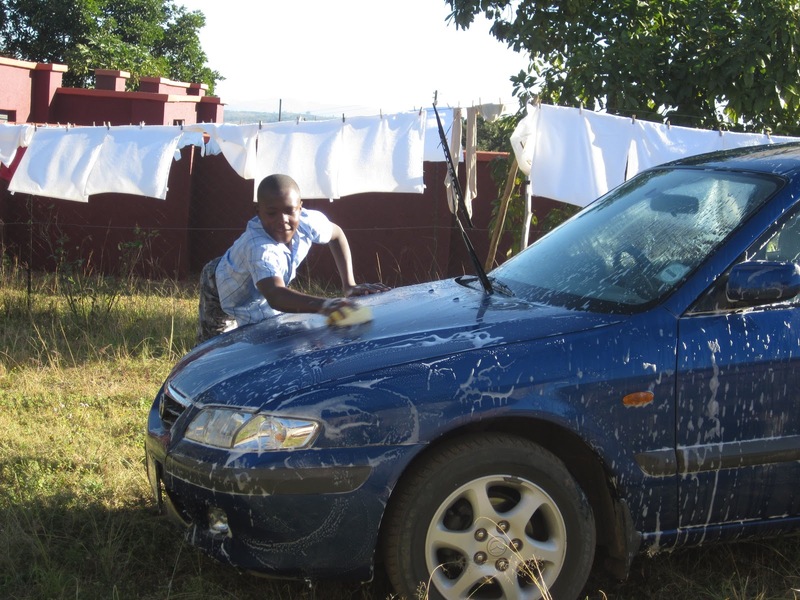 Samkelo and Bongani begged me to allow them to wash the car. They longed to celebrate through serving and stewarding our blessing well. Parked in the space in the yard they made for me, using water that was not easy to come by, the boys scrubbed, shined, and beamed. “Shiny, shiny, shiny…. So nice,” they said over and over again. We cranked up the radio and danced and celebrated. I tried to pay them and they refused. They said it was for Family. Every time I came, they begged to wash. Finally, I insisted on paying them R5 each – about $0.75USD. It was like I had given a million bucks. They raced to the shop to buy sweeties – a few pieces for themselves and the rest for their family. That 5 Rand was gone in less than 5 minutes. Over time, we talked about budgeting. Although I might be the furthest from qualified in the ways of financial planning, I had access to Truth. So, through a translating auntie, we talked about what God says about money. Once they had access to Truth and to knowledge, they absorbed it like a sponge. They giggled and delighted at the ideas of budgeting and started setting goals together. 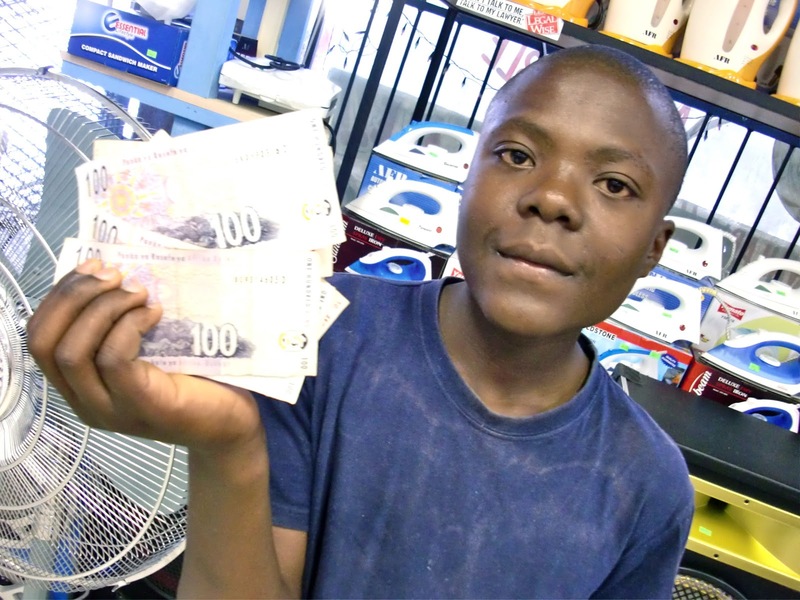 They asked me to hold their money so they wouldn’t be tempted to spend it, and they began to take pride in their work. It was always, “Shiny, shiny, shiny… so nice.” They’ve done so well, they’ve earned raises. 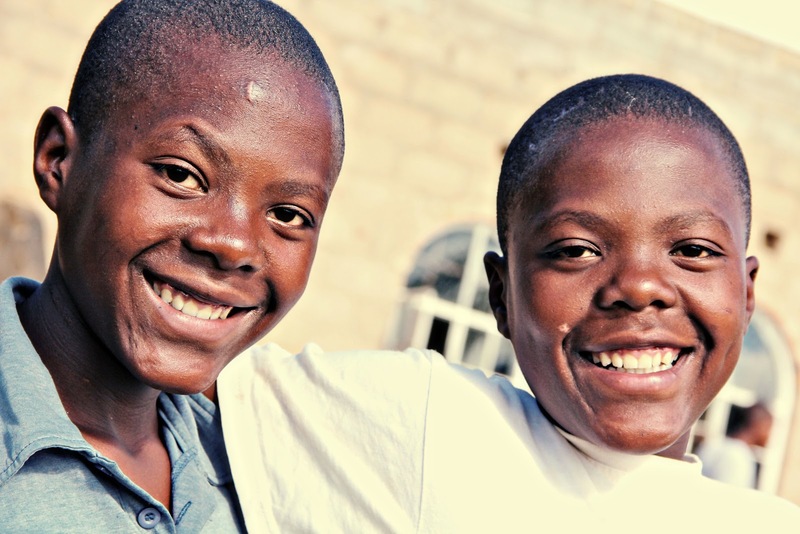 They had access to something they’d never known before: Samkelo and Bongani knew it was possible to live for something beyond today. I think that’s what we call Hope. We’ve had a hundred car wash dance parties. One week, the babies piled in the backseat to the irresistible beat of the Black-Eyed Peas while Samkelo and Bongani cleaned the front seats. At the end of the day, we realized that tiny little dancing fists had demolished the speakers on the back dash. So Samkelo and Bongani took a 10-week pay cut to help pay for the speakers. In the "tough love" process, they gained a new sense of protection and respect for their work and our blessings. Samkelo and Bongani’s first saved up for was a garden. 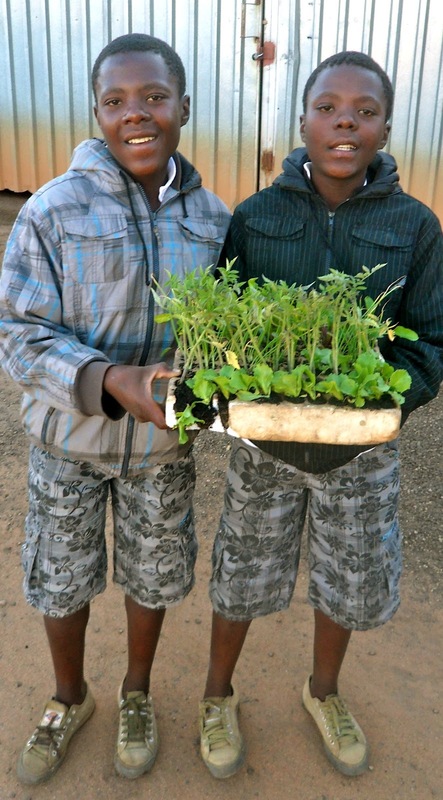 They saved up, we went to a nursery, and they delightedly picked out just the right seedlings to grow vegetables for their mother, their extended family, and even for me. Next, they were able to save up and buy cell phones! And then they could afford to go on a field trip with their school! Finally, they set their sights high. The boys wanted to buy a television. They dreamt as they washed. They reminded me every week what they were saving for. They wanted to count their money every week. Every week that, “Shiny, shiny, shiny… so nice,” meant they were that much closer to that electronic dreambox. 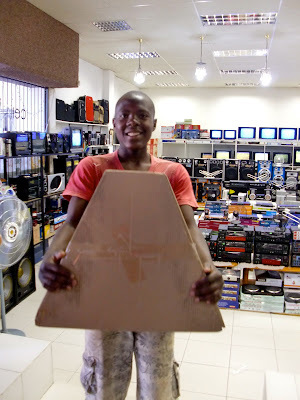 They thought they could get one for R400. ($50) They didn’t want to wait to get a bigger one – they wouldn’t have space anyway. They worked hard - oh so hard. FINALLY, the day came when the boys had R410. They giggled and rejoiced… And then I reminded them about tithing. The young men proudly walked down the aisle at church that Sunday and deposited R20.50 each in the basket at the front. 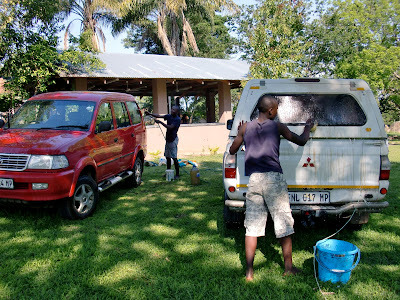 I shared with the TTH staff the rising anticipation and the accomplishment of the boys, and another staff family decided to get their car washed too to help out. After tithing and a double-duty car wash days, the boys had R460. Their mother wasn’t sure it would be enough still, so she selflessly walked to a neighbor’s house and borrowed R100, (at least a full day's work!) not wanting the boys to miss out on what they’d worked so hard for. And into town we went! With 2 of their friends in tow! With R560 burning a hole in their pockets, they browsed every set in the shop. There was one for R400 and a significantly larger one for R500. They collaborated in SiSwati while their buddies oogled over electronics they’d never seen. Samkelo and Bongani came to me beaming. 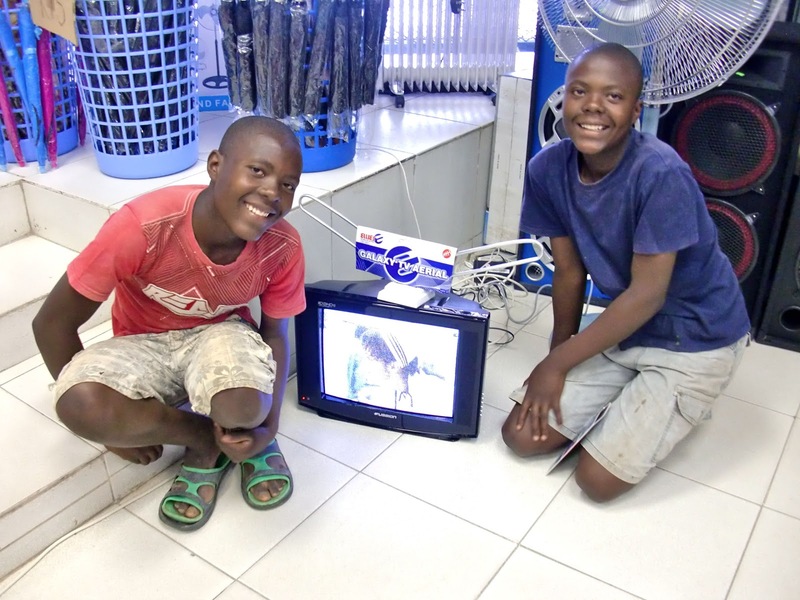 Through very broken English, they told me they wanted to buy the R400 television so they could afford the batteries for the remote and an antenna – and return their mother’s money. We had a small photo shoot, a few victory jumps and yelps, and then piled into the car – giving that 17” piece of glory its own seat. On the car ride back, the thankful game brought me to tears. They had waited an extra week because they chose to tithe. They had gotten one size smaller than they could have. But Samkelo and Bongani walked out of that television shop with hearts even fuller than their arms. They had access to the Truth, and they had consumed it. At 15, these boys are walking in wisdom, faithful giving, and grabbing onto a hope for tomorrow. The rest of their circumstances haven’t changed. They still get too hungry. Too tired. There’s still water to fetch. A family to care for. And a thousand struggles in their daily lives. They even asked to stop by the TTH feeding program on the way home because they were too hungry to focus on their new TV. But despite every damaged speaker, every delay, every trial, there is Truth. Truth that you can’t feel on some days. Truth that makes you wait another week, another year, or until eternity comes down. Truth that makes you reach only to the R400 shelf on this day, but Truth that sets you free everyday. What a beautiful lesson on earning something worth working for. The smiles on these sweet boys faces is priceless! Glad to see a dancing Lifa also! We have been enjoying the company of Paul and Auguste these last 6 wks in USA,and their time to return to Namibia is nearing quickly. 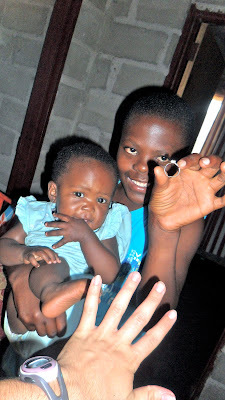 They have shared videos and pics of the beautiful Namibian children too!